Wedding Cake Topper 8.5"H, Weight 8.4 oz, Resin and Stone mix, rhinestones, fabric tulle veil. Oval Base - 3.3/4" x 5"
'Endless Love' Cake Topper is available to order now. Language of Love designed by Gina Freehill is a complete wedding & anniversary accessory line. It has a timeless charm that will enhance your special day and your cherished memories for years to come. 'Endless Love' Wedding Cake Topper features the brides hair down, beautifully sculpted with a sparkle tulle veil. The elegant fitted wedding gown captures a sophisticated style, accented with rhinestones and an engraved literary caption along the bottom. This piece showcases a modern look of beautiful brides today. 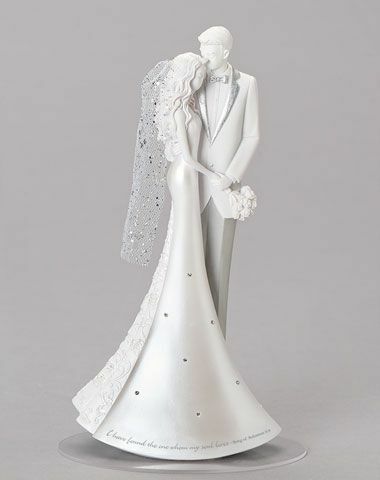 The Endless Love cake topper is captivating and portrays the beauty of modern elegance. 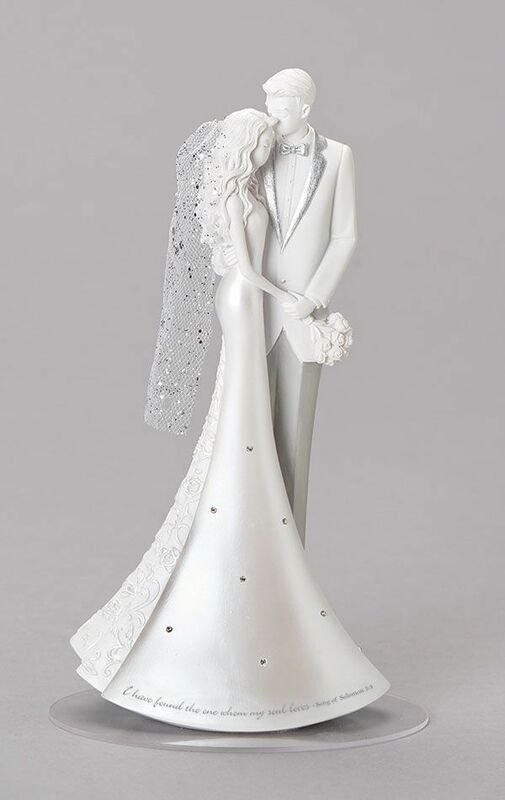 The Endless Love Wedding Cake Topper is also a stand-alone collectible and as an added value to customers the collectible size 'Language of Love' Cake Toppers are hand signed by Gina Freehill. Check out Topper Talk with wedding cakes from around world. Brides and grooms are posting their stories online about which cake topper from Gina they chose for their wedding cake. See the awesome photos and read their stories!